Hip hop artist Kaleb recently released his mixtape “Blac Lion Vol. 3.” Coast 2 Coast and Blac Sheep Entertainment present the project, which is now available for free download. “Blac Lion Vol. 3” features Kaleb on tracks with guest artist appearances from Zsajalyn Jones, Unc, ODE, and Haze. Born in Minneapolis, MN, Kaleb hails from a place that has produced mega-stars such as Prince and hit producers Jimmy Jam and Terry Lewis, who have produced for the likes of Janet Jackson and Christina Aguilera. Kaleb grew up in a single parent home and got into a lot of trouble as a youth. His mother noticed that he had a bad temper and encouraged the youngster to write poetry as a form of relief. This was the beginning of what would soon become his passion. Kaleb moved to the East Coast as a teenager. Growing up in different parts of the country afforded Kaleb the opportunity to become a well-cultured individual, which is reflected in his music. He attended Job Corps at the age of 16 in New Haven, CT, where he began honing his skills as an MC. Now at 26, with three classic mixtapes under his belt and numerous shows throughout the nation, Kaleb is ready and working to become a household name. His work ethic is second to none and his love for his fans will make him an icon. Kaleb is musically inspired by artists from all genres of music, from Miles Davis to 2Pac. “Blac Lion Vol. 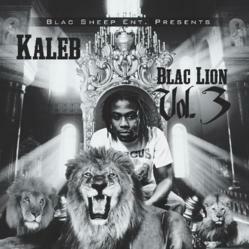 3” is available for free streaming and download at http://coast2coastmixtapes.com/mixtapes/mixtapedetail.aspx/kaleb-blac-lion-vol-iii.